Jim Carrey guested "The Office" season finale last night in the hourlong episode 'Search Committee'. 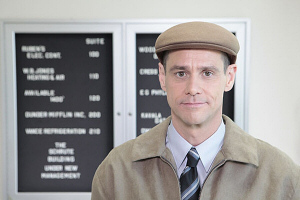 Jim Carrey didn't get as much screen time as Spader and co., but his appearance as the Finger Lakes enthusiast with funny accent was one of the highlights of the episode. Many other guest stars were applying for the job, replacing Michael Scott (Steve Carrell) and temp manager Deangelo Vickers (Will Ferrell). Ricky Gervais, Will Arnett, James Spader, Ray Romano and Catherine Tate. The big question was who did they pick? No one! Fans of the Series have to wait for its 8th season. -- Source: NBC. Click to comment this article.